The most romantic day of the year is coming up, so it’s time to start thinking about healthy Valentine’s Day menu ideas ASAP. Whether you’re celebrating with a significant other or a group of girlfriends, or making it a family affair with the kids, there are plenty of ways to indulge (without all the calories). So skip the prix fixe dinner menus and tough-to-get reservations and book a date night in. Here’s everything you need to prep your special evening. Before you plan the menu, here are some tips for how to make a romantic Valentine’s Day dinner at home. Cook together. Make dinner prep part of the fun. Tie those aprons, set up cutting boards, and turn on some tunes while you get your mise en place in order. Uncork clean wine. Speaking of getting the party started, pour yourself a glass of wine from Thrive Market while you work. A master sommelier hand-picked each bottle to pair with your favorite dishes. Create a signature drink. If a cocktail is more your speed, shake up something to sip. We love this pink pomegranate martini. Set the mood. Light candles in the kitchen and dining room, or diffuse essential oils. Let’s get to it: chocolate is definitely on the menu. But before you dive into dessert, there are elegant appetizers and fancy (yet easy!) entrées to enjoy. 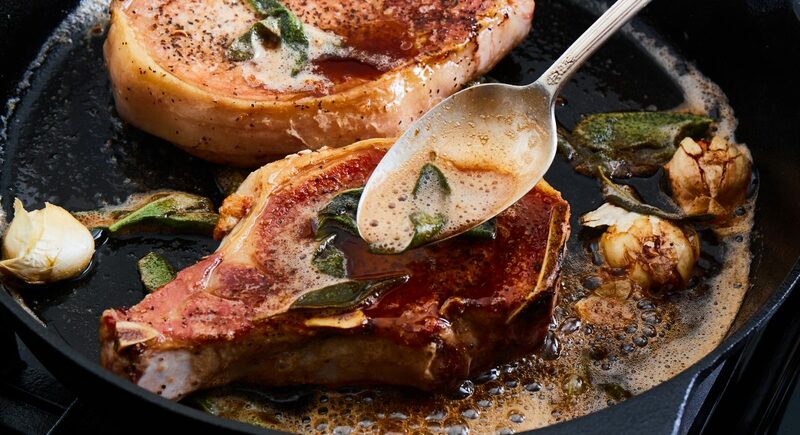 We’re partial to no-cook (aka no fuss) app recipes, especially when you’re working on the main dish simultaneously. Add a little Southern love to your V-Day spread with this vegan cheese dip. Instead of grated cheddar and mayo, this dairy-free recipe uses soaked cashews and nutritional yeast. Serve with your favorite crudités! You’ll never know there’s canned fish in this easy app. The thyme and lemon, plus oil-packed sardines add a rich flavor to the spread. You can make it a few hours ahead so it’s ready for snacking. Impress your vegan date with a dairy-free cheese log made with cashews, probiotic powder, and lemon juice. Make it a few days ahead of time, and your app for the big night is done! Here’s a sweet and savory snack that uses cayenne, ginger, and rosemary (plus a light dusting of brown sugar) to jazz up basic nuts. 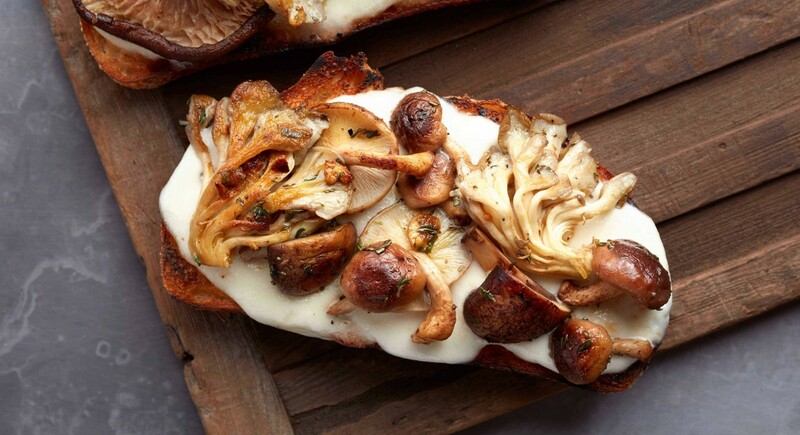 We’re awarding outstanding dinner party app to these cheesy mushroom toasts. The crusty bread, creamy mozzarella, and roasted veggies make a great platter to share. 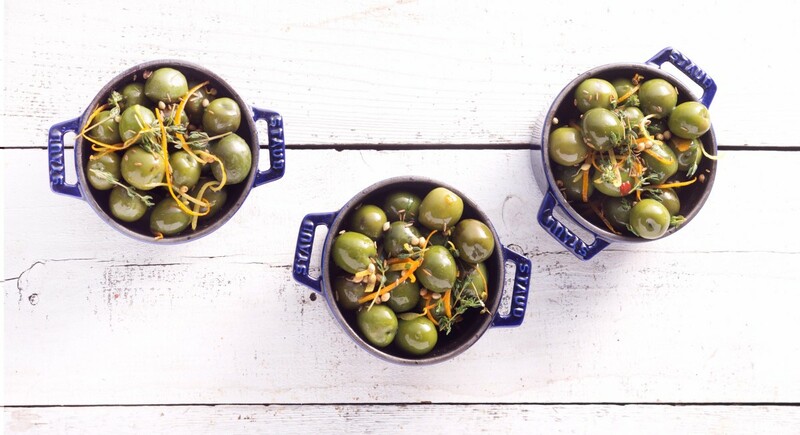 This no-cook app uses pantry staples like EVOO, cumin, and coriander to infuse flavor into briny green olives. From a classic steak dinner to comforting chili, there are plenty of healthy main courses to choose. If you happen to be doing Whole30 this month, no problem! Just whip up a pot of these Instant Pot carnitas. Wrap them in butter lettuce instead of tortillas for a taco feel without the grains. Is there anything cozier than a bowl of chili? On this winter night, curl up with a light, Whole30-compliant recipe you can make right in the Instant Pot. Thanks to chopped mushrooms, this vegan bolognese takes Italian night to new heights. The rich tomato sauce made with veggie stock, garlic, and fresh rosemary is delish. The cherry steak sauce really steals the show here. Its natural sweetness is balanced with apple cider vinegar, brown sugar, and red wine. 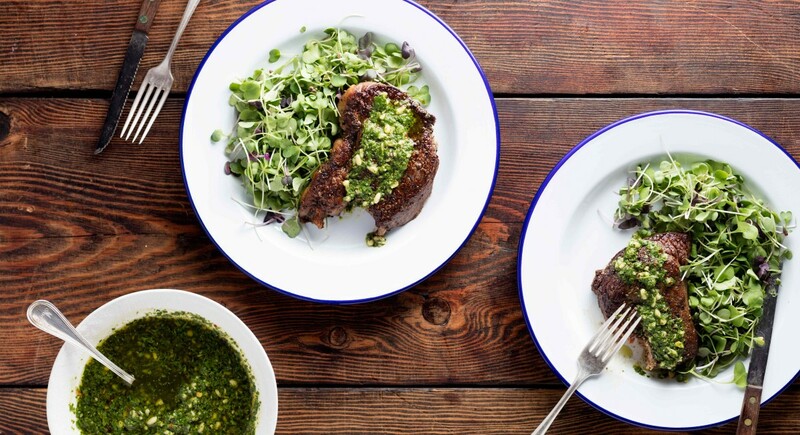 If a fruit-based steak sauce isn’t your jam, turn to fresh herbs paired with garlic and pine nuts. It’s a topping that works beautifully on both grilled meats or veggies. This elegant dish takes its cue from Spanish cuisine. The roasted red pepper sauce is extra flavorful thanks to rich tomato paste and earthy walnuts. 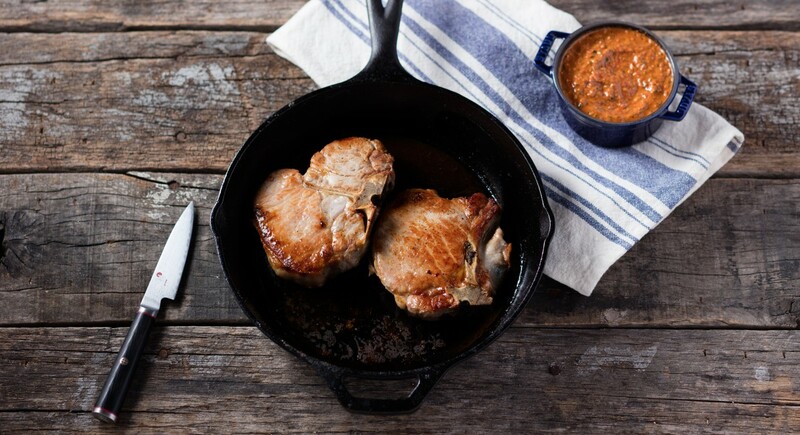 These chops are basted with sage butter (need we say more?) and cook up quickly on the stovetop. Make it a meal with a side of green beans, mashed potatoes, or a hearty grain like barley or farro. Curry in a hurry? 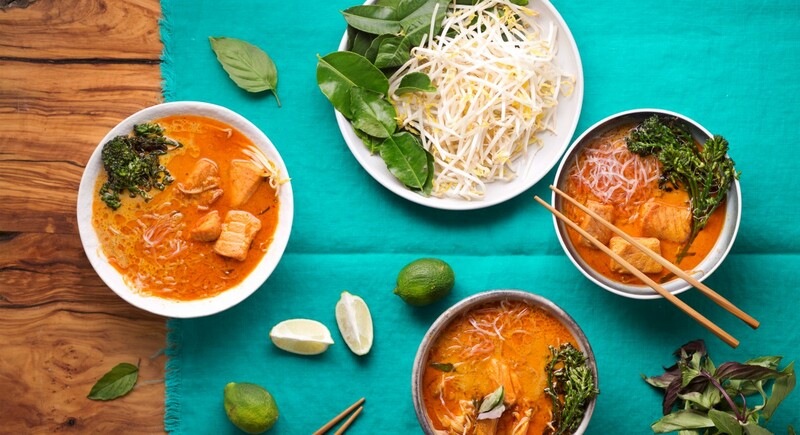 This one’s ready in under 30 minutes and uses kelp noodles instead of rice so you can enjoy all the rich, spicy flavor of curry minus the heavy carbs. If you scrolled to the dessert section first, we get it. This course is extra important this holiday, so we’re pulling out all the stops. Healthy is relative here—everything in moderation, right? And if you don’t have time to make dessert from scratch, just pick up truffles instead. Not your average ice cream, our lighter take uses a coconut cream base, avocados, and natural sweeteners. You’ll love digging into the resulting rich custard—bowls optional. These vegan cheesecake treats are made with a crumbled protein bar for extra nutrition, then layered with a creamy filling made from soaked cashews instead of cream cheese. Add a chocolate drizzle for a craveworthy post-dinner delight. Perfect for a party, but totally worth it if you’re going all out for an intimate at-home date, this vegan chocolate cake will impress any guest. The frosting—made with whipped avocado, maple syrup, vanilla, and cacao—is extra luscious yet dairy-free. Our five-ingredient fudge recipe practically makes itself. You combine coconut oil, cacao powder, almond butter, honey, and vanilla extract, then chill and slice it. Easiest dessert ever! 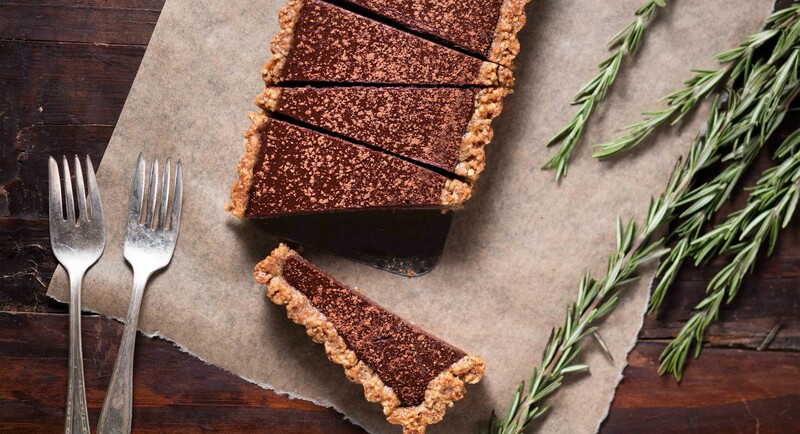 Make all your chocolate dreams come true with this stunning tart infused with woody rosemary. It takes about an hour and a half to make, so get started early with your sweetie. Granita is an Italian shaved iced and when it’s flavored with cold brew and drizzled with creamer, it’s the perfect (slightly caffeinated) ending to any meal. Puffed quinoa adds serious crunch to these delicate morsels that beat store-bought treats any day of of the week.